Where is Colin Powell's white paper proving Bin Laden did 911? France is complice in the killing of thousands of Afghans. We still have not had Colin Powell's white paper proving that Bin Laden did 911 !! Is there no white paper because there is no proof ? If that is the case can France be put on trial for complicity of crimes against humanity in Afghanistan ? mouv4x8 on Fri, 07/10/2009 - 6:45am. And why hasn't Bin Laden been Indicted? for Sept. 11..... Just doesn't make any sense. We never got the white paper proving he did it.... he was never charged for it-.....and his Most Wanted poster doesn't mention it! Yet we are still in Afghanistan with designs on a drawn out military occupation in an impossible war zone risking American GI blood. Never a declaration of war as required by the Constitution-- just a conditional temporary authorization 8 years ago! Something has to give. I wonder if NYC CAN will be able to bring this to light for public debate. No hard evidence connecting OBL to 9/11........ but there IS hard evidence for controlled demolition. RL McGee on Fri, 07/10/2009 - 4:24pm. Is not an innocent man. SnowCrash on Sun, 07/12/2009 - 5:37pm. is not an innocent man for what ...911?, figthing against the URSS? , etc ? For me it is more likely that 911 was an inside job ! Colin Powell has still to put the evidence against Bin Laden on the table ! 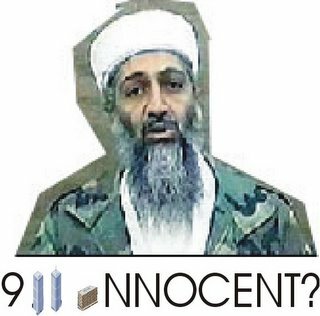 For me Bin Laden is 911 innocent ! mouv4x8 on Mon, 07/13/2009 - 6:41am. The AfPak War is not a war against terrorism, or for democracy, or to help the long-suffering Afghan people. It is an indefinite, colonial war whose central aim is to turn Afghanistan into a US client state and ensure that Pakistan remains firmly under Washington’s geo-political influence." Joe on Fri, 07/10/2009 - 8:27am.